Never even heard of the W1! Brilliant looking loco. Cant wait to see the finished article. 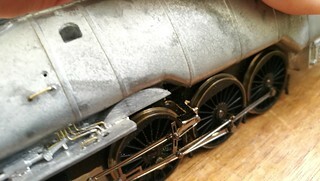 I don't think my skill or ambition will ever get to loco building, so hats off for even trying! Really? I guess that's why they called it a Hush Hush It's an interesting beast only lasted 6 /7 years, just a shame they never stuck with the water tube marine boiler idea, sadly hadn't quite got to grips with the technology..
After the Christmas break I placed an order for some A4 Valve gear (X9321), this is due to the Hornby A3 mounting bracket having a step down of 1-1.5mm in it, which caused the linkage to the expansion link to point downwards when the wheels crank pin was at half past, using the A4 parts I believe this will fix that, and probably cause some more problems along the way. 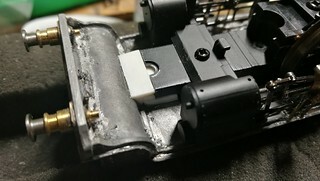 As expected, the valve gear being raised caused problems mainly with the body shell, not wanting to do surgery on the body, I took a dremel to the bracket to cut away where the body was being held up. This was done successfully and the body now sat level on the chassis, meaning a test run was in order. 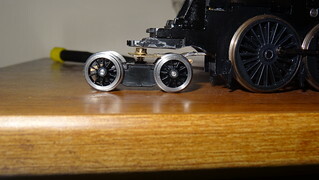 Taking a small break from the chassis as the next part will be quite hard work re-working the rear end to accommodate the trailing wheel sets / bogie. 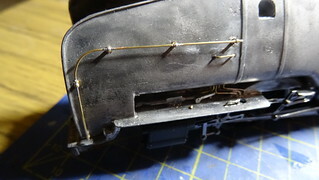 So I move my attention to shaping the hand rails, the kit was kindly supplied with handrail knobs, the end holders were tacked in place to hold the wire and shape it so I could get the position right and also the shape. Once happy, I added the additional handrail knobs to the handrail and placed them in their respective holes, then soldered them to the handrail. 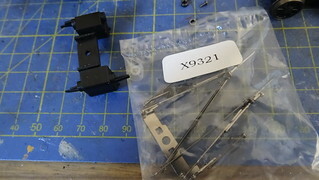 Then I turned my attention to the front end again, and added the lamp irons which are included in the kit part of the chassis etch. 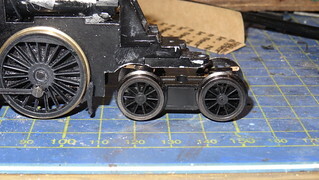 With the wheels probably the next thing to show, I needed to start on the rear mounting for the rear wheel set, now being someone who likes using spares a lot, I used the drawings to buy a bogie with the same wheel spacing as I wanted something with pickups just to aid the model as It won't have tender pickups. So how do I mount it to the chassis? 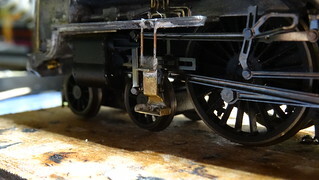 I made up a swing arm, using some brass sheet cut out to my measurements with a wide section at the rear with a slot to allow the bogie to move from side to side. 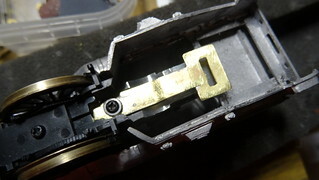 The long section from the mounting point to the swing arm was laminated so another piece of brass on top just to strengthen it. This swing arm was made to fit the chassis where the plastic moulded section of plastic surrounding the trailing wheel set. 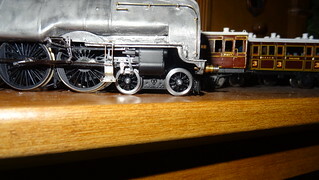 Other parts to arrive were from Peters Spares, the new sprung buffers produced by Markits, were a suitable better looking, than the white metal cast option, and although there is no real use to the sprung buffers, I add them more due to them being better looking and nicely turned. 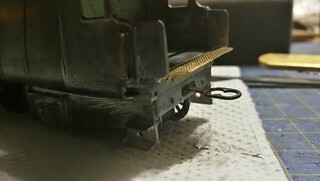 The front set will be soldered in to place where as on the tender they will be glued in place. 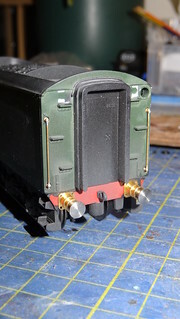 Holes were enlarged on the front to 3mm, whilst the work was on going I also filled the screwlink hook hole which I will re-drill to fit a spare Hornby one I have hanging around. Excellent job on mounting that rear wheel set, I'd have thought it was straight from a factory had I not seen this here. Congratulations on being published by the way, a great article on 3-d printing and very helpful directions on free programs to get started in creating one's own CAD designs. Thank You Nickbrad, It did turn out quite well, even if I actually hadn't planned it out that way before buying the chassis so a bit of Dangerous modelling haha, but yes works quite well although I expect it will require some minor tweaking. Yes thanks I had actually forgotten about that, nice to know someone has seen it, as I don't like to advertise that I have written anything, did seem a bit of to write about 3D printing for a beginners mag but I guess it let's people know it's out there and what it can do. I will definitely be looking forward to the completion of this,I don't think I would be game enough to try something likes this. Id pike out and use superglue. Looking good there. I do like your thinking regarding the rear bogie - exactly the type of thing I would do! I'm really looking forward to seeing this one finished! Thank you for you comments chaps. Tony, I would more use Araldite glue for white metal, as it can be used more as well for filling gaps ect, Superglue is good for small things, not so much for bigger items. I would say its more practice and knowing what I can get away with and having done quite a few of these types of build using RTR chassis, It's best to have a vision before I started, then work on it, and refine it. Thanks Steve, yes always enjoy working these things and using different parts... makes it fun. capacity. 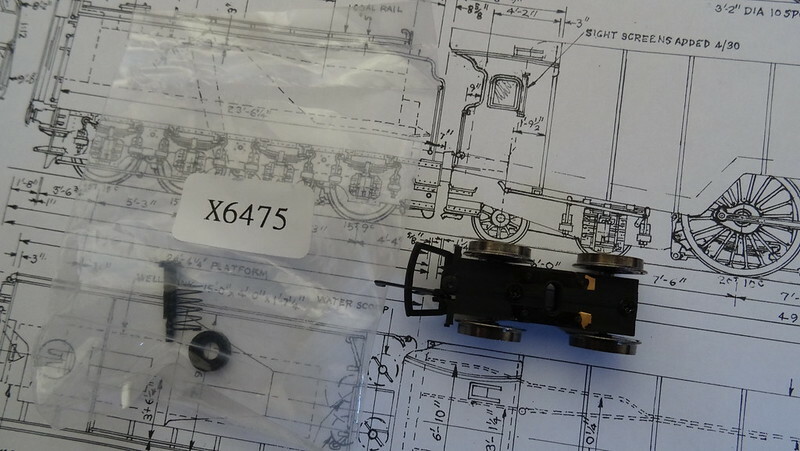 I hadn't planned on using the tender which came with the kit, due to it being the wrong one which I have read on various forums, as it's too wide, and with my spare Bachmann tender fitting the drawings I went with my spare. 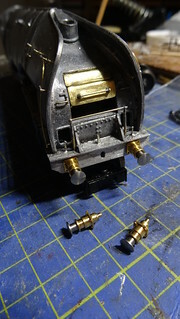 I stripped down the tender removed the tampo printing, and all the hand rails as they were a fair bit over sized, so I have just replaced these with short versions, also removal of the buffers and replacing them with the Markits ones mentioned before. There was some reshaping on the front of the tender which was easy enough to do, at a later date I will sort out a coupling system. 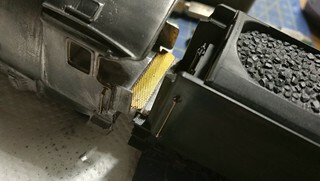 Heading back to the loco end, I needed to add some steps to the running plate, the kit has supplied with it 2x white metal cast steps, but these are also wrong in terms of shape, and plus with the slide bar behind it the area is quite tight and room is limited. 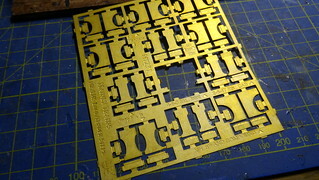 So looking through my detail etches, I had some etched steps from Mainly Trains, sadly recently Mainly Trains have recently closed and I will certainly miss their detailing parts. I used some steps which were close enough to the drawings which needed some slight reshaping. The bottom section leans backwards as it passes the parts of the motion. 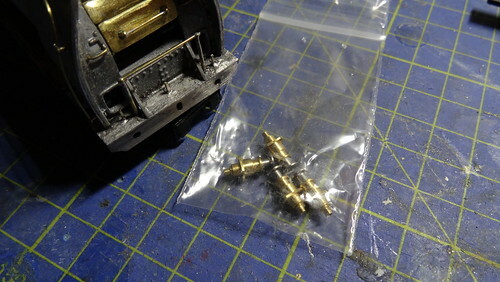 I had to solder 2x 0.5mm brass to the step and the running plate no easy task but I managed, and looks ok.
Moving back to the swing arm on the rear, I found all the bits to make the attachment, using an M2 brass screw 2 brass washers, 1x spring from a pack from Elieen's emporium and a small cup washer I had in my spare box to support the spring, and an m2 nut to keep it all together. With the wheels arriving from Alan Gibson this meant that I could set up the heights of the springs to get the chassis nicely balanced. That might be the final update for a while as my camera has now decided to pack up which was not expected and do not know the cost of fixing it.. so might be the last post for a while. Sorry to read about your camera Matt. I hope that you can get if fixed quickly (and cheaply!) so that you can continue to document this awesome build! Well lets hope sadly it's Sony.. so I expect it will be anything but we will see, just noticed being half asleep last night I posted the same thing twice. oops lol. I'll see if my phone camera is up to the task especially with the smaller bits. I shall post the last few parts before my camera decided to die, and might not be fixed till end of February... so shall have to get by with my mobile camera. 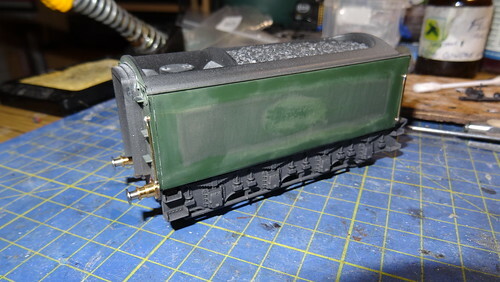 With the chassis only being a test fit it was time to make 2 mounting points one at the front and one at the rear, I will be mostly using some plasticard for this. At the front I used various layers of thick plasticard to achieve the desired level, and shape for the chassis to sit on. 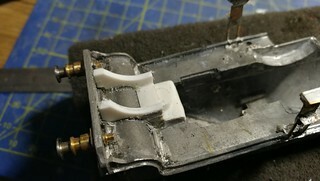 The plastic is glued to the metal with Araldite with just mounting holes only to drill. 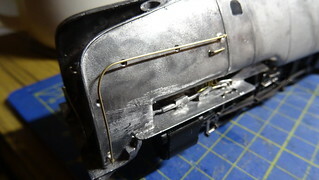 Next on the list was a fall plate between loco and tender, I used the some 0.6mm brass wire for the pivot for the plate, and for the fall plate I used some diamond plate etch from mainly trains to construct the fall plate. It fills the gap nicely.